When the Chilean volcano Villarrica exploded in 2015, researchers trying to piece together the eruption had a fortuitous piece of extra data to work with: the inaudible infrasound signature of the volcano’s subsurface lava lake rising toward the surface. Volcano forecasters already use seismic data from volcanic vibrations in the ground. But these “infrasound” signals are different. They’re low-frequency sound waves generated by vibrations in the air columns within a volcanic crater, can travel many miles from the original source, and can reveal information about the shape and resonance of the crater… and whether it’s changing. And two days before Villarrica erupted, its once-resonant infrasound signals turned thuddy—as if the lava lake had gotten higher, and left only a loudspeaker-shaped crater to vibrate the air. Jeffrey Johnson, an associate professor of geophysics at Boise State University, explains how scientists are gathering infrasound and learning to interpret signals to understand what’s happening deep inside volcanoes—and why a signal from the Ecuadorian volcano Cotopaxi is exciting just for the unique shape it makes. Plus, Science Friday digital producer Johanna Mayer, who leads the Science Diction project, pulls back the curtain on the origins of the word ‘crater’—which originally had nothing to do with volcanoes. Learn more about how volcanic music could help scientists monitor eruptions. Listen to Johnson’s account of when he witness Villarrica erupt in Chile. Jeffrey Johnson is an associate professor of Geophysics at Boise State University in Boise, Idaho. JOHN DANKOSKY: This is Science Friday. I’m John Dankosky. If you’ve been following our Winter Book Club, you know volcanoes are high on the list of topics that we’re nerding out about in the next few weeks. The club is tackling NK Jemison’s apocalyptic book The Fifth Season, which follows a world constantly in upheaval from earthquakes and volcanoes. We’ve got a Facebook discussion group, weekly newsletter, and a lot more. It’s not too late to join the fun. Check out everything you need to know on our website sciencefriday.com/bookclub. But in the meantime, volcano forecasters have a lot of tools for figuring out when a dormant volcano is getting active and when it might actually erupt. Seismic monitoring, gas emissions, and maybe someday the vibration of air masses in the volcano’s crater. Those vibrations are very low frequency and silent to our ears. But with the right microphones and the right processing, that sound becomes data that can tell us about the shape of a crater, the location of lava at the bottom, and a lot more– something a little bit like this. Here to explain more is Jeffrey Johnson, associate professor of geosciences at Boise State University in Idaho. Welcome to Science Friday. Thanks for joining us. JEFFREY JOHNSON: Thanks very much for having me. JOHN DANKOSKY: So I just played a sample of some volcano vibrations. What does it actually sound like to our ears, though? And maybe you can explain what you’re listening to. JEFFREY JOHNSON: Right, well, what we just heard was a recording from a volcano in Chile, called Villarrica, over the course of about five days. And you heard it in just a few tens of seconds. But what you might have been able to detect is a change in the timber and both frequency of those sounds. Now what we actually recorded was infrasound– low-frequency sounds below the threshold of human perception. But when we speed those up, we can detect them and perceive something with our brains. JOHN DANKOSKY: OK, so a little too hard to hear, but you’re able to make it something that we can hear. How is infrasound different from vibrations from seismic activity? JEFFREY JOHNSON: Well, volcanoes will produce both seismic energy that propagates through the ground and when activity is occurring at the surface of the volcano, such as for explosions, we also radiate sounds into the atmosphere. Volcanoes produce sounds that are both audible and subaudible, and it’s these subaudible sounds that are so much more energetic. And that’s the focus of many of our studies on the subject of volcano acoustics. We focus on infrasound energy below 20 Hertz. JOHN DANKOSKY: The very low frequencies that we’re talking about can travel quite a distance, can’t they? They can be sensed a very long way away. JEFFREY JOHNSON: Right, so low-frequency sounds have the capability of propagating long distances with low attenuation, which is why you have fog horns and not fog whistles when you want to listen to boats that are a long ways away. Volcanoes just so happen to produce a lot of infrasound. Many of them produced sounds about 1 Hertz, which is something like five octaves below the threshold of human perception. And these low-frequency sounds can attenuate very slowly and be recorded regionally or even globally, in some cases. JOHN DANKOSKY: Explain a little bit about what the volcano is doing to create these sounds in the first place. What exactly are we hearing happening? 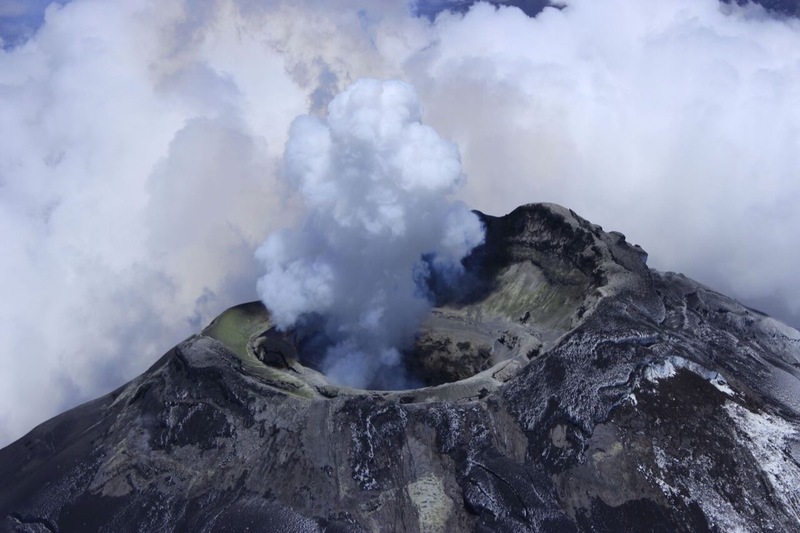 JEFFREY JOHNSON: Well, the sounds we just listened to come from a volcano that has a giant crater that extends down from the crater rim down to a lava lake about 100 to 150 meters below the crater rim during most regular times. And this lava lake is bubbling away. It’s exploding. We call these explosions strombolian explosions. And every time there’s a burst, there is a sound wave that’s radiated up and through this crater and can be recorded many kilometers away from the summit. What we’ve noticed at this particular volcano is those infrasounds from those explosions have changed over time. And we are relating those changes to the rise of the lava lake within the crater. JOHN DANKOSKY: Maybe we can listen to that sound one more time again. This is from the volcano Rica in Chile. Let’s listen. Maybe you can explain for our listeners a little bit more what exactly we’re listening to there. I mean, what is it you’re hearing in that sound that is meaningful to you? JEFFREY JOHNSON: Well, we’re listening to explosions recorded with infrasound but sped up into the audible domain. And one thing you might have picked up is that the frequency content changed. And at the same time, maybe a little bit more subtle, the timbre of these sounds changed. And so has this lava lake is rising up within the crater, we’re effectively shortening the tube of this acoustic resonator, and that’s creating these higher frequency sounds. Our study from 2018 analyzed another aspect of the sound, however, and that is this thing called the quality factor– the amount of resonance that those sounds are exhibiting. In other words, in the early portion of the sequence, this pipe was resonating very nicely, almost like a musical instrument. And towards the end of the sequence, as the lava lake rose to within 50 meters of the crater rim, the resonance was gone, and it was just these explosions that sounded like thunks. JOHN DANKOSKY: Sounded like thunks and they sounded like thunks because why? Well, volcanoes as musical instruments only works when the crater shape is of a certain form. And so in the case of Villarrica, we had this giant shaft 150 meters deep, about 60 meters wide, and that was able to very effectively trap acoustic resonance that was oscillations of air masses within the system. There was a large impedance contrast at the atmosphere crater interface. As the lava lake rose, the sources that are occurring at the lava lake surface are now being projected out into the atmosphere, and they’re not being bounced back or reflected at that crater opening. It has everything to do with the geometry or shape of that flaring crater. JOHN DANKOSKY: We have another recording here. This is a signal from an Ecuadorian volcano called Cotopaxi. Let’s listen to that. So that actually sounds very much different. It almost sounds like a human breathing or maybe waves on the ocean. What are we listening to there? JEFFREY JOHNSON: Well, there are a few tricks that were done to make that infrasound audible but suffice to say that what we are listening to right then was an infrasound signal from this volcano called Cotopaxi that was played in near real time. And the crazy thing about Cotopaxi is the beautiful signals that this volcano musical instrument is able to create. By beautiful, I mean if you were to look at the waveform, you would see a five-second oscillation that endures for something like a minute and a half. So what’s actually happening is you’re exciting this crater, this giant musical instrument with some source at the bottom, and you are causing an oscillation to occur for more than one minute. And of course, these oscillations are inaudible. But with our specialized microphone some eight kilometers away from the vent, we’re able to pick up on these signals and use them to determine the size and the dimensions of that volcano crater. JOHN DANKOSKY: So you’re able to use this to determine size, volume, know a little bit more about what’s happening inside. How can this help us predict eruptions or events that are happening that could obviously be problematic for humans living nearby? JEFFREY JOHNSON: Well, the Cotopaxi example was a case study where we recorded this beautiful signal that wasn’t changing over time. So for six months in 2016, we recorded the same signal again and again and again. That allows us to say something about the rather stationary behavior of that volcano. In other words, whatever was happening down at the bottom of the crater– and we don’t quite know what that was– was constant. That process was occurring again and again. In the case of the Villarrica, we were alerted to these changes in the nature of the infrasound, which became suddenly much more interesting. Volcanoes, when they maintain their background state, are well-behaved volcanoes. When that background state changes and you see signals that evolve over time, that’s the time when you want to pay attention. JOHN DANKOSKY: Would it make sense to be able to listen to volcanoes, to be able to monitor infrasound. In volcanoes all around the world, are some volcanoes better candidates for this sort of experimentation than others? JEFFREY JOHNSON: Indeed, scientists are listening to volcano infrasounds all over the world now. It’s become an established component of the volcano monitoring toolkit. And there are dozens of volcanoes right now where infrasound data feeds are complementing the seismic or the deformation or the gas remote sensing technologies. And many volcanoes do produce very interesting infrasounds, which are being tracked in real time. One thing to mention, though is that unless a volcano is actually doing something at its surface, the infrasound is less interesting. And, in that case, we look at the seismicity– the earthquakes occurring beneath the volcano, beneath the volcano surface to infer processes. JOHN DANKOSKY: I know that it’s probably not only volcanoes that emit infrasound. So what else can you learn? Are there other things that we can study, aside from volcanoes, by using sound? Yeah. JEFFREY JOHNSON: Sure, infrasound remote sensing is being used for a number of geophysical source studies, and some of the most interesting studies that I think are happening right now– our group at Boise State University is focused on this– is using infrasound to track and detect snow avalanches. Snow avalanches produce a lot of energy that is audible, but most of its energy is beneath the threshold of human perception, right around 5 Hertz. So if we’re listening to these processes with infrasound, we can detect when avalanches have occurred, even when we can’t see the slopes. JOHN DANKOSKY: Jeffrey Johnson is an associate professor of geosciences at Boise State University in Boise, Idaho. Thank you so much for talking volcanoes with us. I really appreciate it. JEFFREY JOHNSON: Thanks very much. JOHN DANKOSKY: Now speaking of craters, our second season of Science Diction kicked off last week. This is where we dig really deep into the roots of science words and tell you all about it. And the first word we looked at yes, crater, which it turns out, has nothing to do with volcanoes– at least originally. Here to explain why is sci-fi digital producer and master of Science Diction, Johanna Mayer. Johanna, welcome to Science Friday. Thanks so much for joining us. JOHANNA MAYER: Hey, John, thanks for having me. JOHN DANKOSKY: OK, so where did crater come from, if not volcanoes? JOHANNA MAYER: So take a look at pretty much any depiction of an ancient Greek symposium. You’ll see a ton of guys hanging around, philosophizing, wining, dining. And nearly always in the center, there’s this urn positioned really prominently. That’s called a krater. It starts with a K. And the crater is super essential for symposiums because that’s where they would mix wine and water. JOHN DANKOSKY: Hold up– they’d mix wine and water? I thought that they just wanted the wine without the water. JOHANNA MAYER: I know that sounds very blasphemous to us today. But actually, wine in ancient Greece was aged in these clay or leather containers that resulted in a really acidic taste and also a much higher alcohol percentage. We’re talking about 16%. The stuff that we drink today is around 12% or 13%. So the ancient Greeks actually considered it really barbaric to drink the undiluted wine. JOHN DANKOSKY: Oh, OK, so it wasn’t cool to drink straight wine. I get it. So how did we start using this word to talk about volcanoes then? JOHANNA MAYER: Since about the 1600s, people have been using the term to describe pretty much any bowl-shaped depression, like you would find in that ancient urn or in a volcano crater today. And actually, fun fact– it was Ralph Waldo Emerson who was the first person to apply the word to lunar craters. JOHANNA MAYER: Mm-hmm. Yeah, I was surprised to learn that too. JOHN DANKOSKY: That’s really interesting. OK, so I introduced you as our Science Diction wizard because you’re rounding up the science origins of tons of words. I’m assuming you’ve got a lot to work with. JOHANNA MAYER: That would be an understatement. Science– it’s everywhere. It’s baked into the words that we use. It’s encoded in the language that we speak. There’s no shortage. JOHN DANKOSKY: I just need to remind you, I’m John Dankosky. This is Science Friday from WNYC Studios. And we’re talking about Science Diction. Maybe you can tell us how people are going to learn more about Science Diction. JOHANNA MAYER: Yeah, just go to sciencefriday.com/sciencediction. We send out a newsletter every week that looks into the scientific origin story behind one specific word. So you can sign up there. JOHN DANKOSKY: OK, we talked about crater already. What’s on tap for this week? JOHANNA MAYER: This week, we’re talking about Spanish flu, which is a total misnomer that has endured for a century. JOHN DANKOSKY: OK, it’s endured because it has nothing to do with Spain? JOHANNA MAYER: Not really. It has a lot more to do with World War I.
JOHANNA MAYER: So when we say the Spanish flu, what we’re actually talking about is the 1918 flu pandemic, which was devastating. I’m sorry, a third of the world was infected. 50 million people at least died. So by the time that this pandemic surfaces in 1918, France, Germany, the US, bunch of other countries were already embroiled in World War I. One country that was not was Spain. So because Spain remained neutral, that meant that they had much greater freedom of the press. They weren’t subject to wartime censorship rules like the UK. They weren’t worried about keeping morale up amid reports of great casualties among troops in camps. So it was a newspaper out of Madrid that was the first to publish a story about the flu outbreak. They got slapped with the name Spanish flu, and it stuck ever since. JOHN DANKOSKY: So what you’re telling me is because Spanish newspapers did such a good job breaking the story of the Spanish flu, it’s now called Spanish flu. JOHANNA MAYER: Pretty much. It’s kind of unfair. JOHN DANKOSKY: It seems a little bit unfair. What about the second part of that– influenza? That’s a really interesting word. Where does that come from? JOHANNA MAYER: So before we had any understanding of the epidemiology or virology, ancient people believed that the stars and the cosmos would flow into us and influence our lives. And actually, influenza means influence in Italian. So the idea is that sickness, like any other unexplainable event, was due to the influence of the stars. And they just went ahead and called one of the most common ailments influenza. JOHN DANKOSKY: So the influence of the stars is what gives us influenza. So it’s not a medical term at all. It’s a mystical term. JOHANNA MAYER: Totally, yeah. It’s kind of poetic, actually. JOHN DANKOSKY: This is why I like Science Diction. Thanks so much, Johanna. I really appreciate it. JOHANNA MAYER: Thank you, John. JOHN DANKOSKY: Johanna Mayer is Sci Fri digital producer and head of our Science Diction project And you can learn more on our website. It’s sciencefriday.com/sciencediction. OK, one last thing today. Ira talked about this last week. He’s on a trip traveling through Southeast Asia. And as he’s traveling, he’s looking around. He’s trying to find cool stuff for us. So he sent an audio postcard from his first stop, and here he is from the northern part of Vietnam. IRA FLATOW: I’m here in Ha Long Bay. It’s an extremely biodiverse site with many ecosystems, including mangrove forests, sandy tidal flats, coral reefs, caves, and lagoons. And these giant limestone karsts that surround the area– gorgeous to look at. JOHN DANKOSKY: I can almost imagine Ira being there. He’s exploring the caves inside those giant limestone karsts, and he said it was one of the most magnificent natural wonders that he’s ever seen. I hope he’s having a great time. Hopefully, he sends some pictures along. I know he’ll be back in a couple of weeks. He’s going to be sending us more of these little dispatches from Southeast Asia along the way.